(NaturalNews) Chronic obstructive pulmonary disease, commonly called COPD, has become the number three disease killer, behind cardiovascular disease and cancer. COPD is a progressive disease. It just gets worse, and mainstream medicine has no cure. 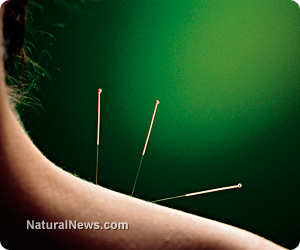 Both the sham and real acupuncture sessions were performed once a week for 12 weeks. Before and after the 12-week period, all subjects were tested for "dyspenia on exertion" (DOE) after a six-minute walk. They used a Borg scale to calculate the perceived intensity of exertion on the walk. They concluded that acupuncture would be a useful adjunct for relieving dyspenia with conventional medical treatment. Why continue using toxic treatments with effective non-toxic treatments? This trial, though admirable, did not include any of Traditional Chinese Medicine's (TCM) other tools - herbal remedies. There are some TCM practitioners who rely heavily on acupuncture, but most incorporate Chinese herbs as well. There are also some Western supplements that have demonstrated a capacity to remove hardened tissues and resolve inflammation. One of them is a proteolytic or protease enzyme from the silkworm known as serrapeptase. Serrapeptase is capable of breaking down proteins and accumulations of inflamed scar tissues and mucous. It is a uniquely powerful proteolytic enzyme that is accessible and not priced out of range. There is quite a story involving a man with severe enough COPD emphysema to need a wheelchair equipped with portable oxygen tanks and a breathing mask. Someone advised him to try serrapeptase and maybe ease up on the steroids. His turnaround was dramatic (https://www.naturalnews.com/026360_serrapeptase_natural_health.html).